Klobuk is a 31m classic motor yacht launched in 2005 by the Custom Line shipyard (part of the Ferretti Group). Designed by Giovanni Zuccon, she is based on the concept of a “timeless classic”, which includes lines and forms that are classic in design but have modern elements too. Maintained to perfect condition by her meticulous Owner, with a recent refit dating 2018, she has the perfect characteristics, performance and layout for chartering the Adriatic Sea. 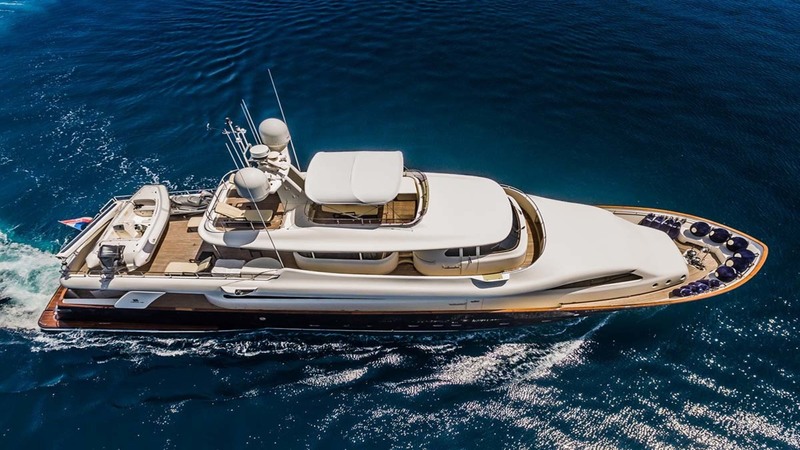 As a semi displacement yacht, she has amazing stability features, additionally having a double stabilization system that also works at zero speed, increasing onboard comfort at anchor and on rough waters. With a cruising speed of 13 knots, a maximum speed of 18.5 knots and a range of 550nm from her 15,000litre fuel tanks, she is the perfect combination of performance and luxury. An element that makes Klobuk stand out are her long side windows of the main deck, which have become an important stylistic element of the yacht. Her interior layout, was designed to be lived in and is particularly well thought-out. The upper deck lounging area is bright and the ideal spot for relaxation on a hot summer day without missing the splendid views of the sea. Continuing aft on the same deck there is a table for meals, naturally shaded as it is protected by the extension of the upper mid-deck. Farther aft is a relaxation area for sunbathing. The upper mid- deck is the ideal spot for overlooking the sea and enjoying where you can enjoy the view far from indiscreet glances. The lower deck houses the guest and crew quarters, comfortably accommodating twelve guests in four spacious cabins, in addition to the Master cabin on the main deck forward area. All of her decks breath elegance and care in the design and creation of each individual element, making each environment comfortable and in line with Klobuk’s vocation as “renowned lady of the sea”.